The MM900EV-LITE is a development module for FTDI’s 32-bit high performance FT90x Microcontroller family, which is used to develop and demonstrate the functionality of the FT900 Embedded Microcontroller. 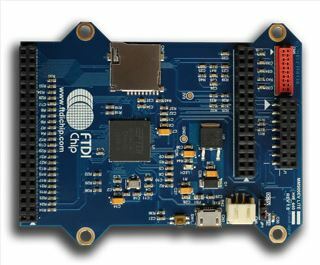 FT900 module, 32-bit microcontroller with 256kB flash memory, 64kB data RAM and 256kB program memory embedded. SD3.0, USB2.0 Device, several interface pin headers and connectors included. Extra memory capacity can be made available via the Micro SD card socket. The standard USB-A port (which provides the USB hosting) is complemented by a Micro-B USB port (which serves as a USB device port and a power source connection). A 40-way expansion connector enables access to the IC’s complete complement of IO, while a Micro-MaTch 2×5 female socket facilitates the debugging/downloading process. An additional two 8-pin 2.54mm pitch connectors and 16-pin 0.5mm pitch FFC/FPC connector permit interfacing with FT800/FT810 EVE display modules. A Micro-B USB for connecting to a USB host or providing a power supply over USB for the board. 2×15 pins 2.54mm pitch female header support for external feature expansions.